A couple of years ago, I found myself with a yellow Pugsley frame (in addition to the Pugsley I already had). At some point, I reckoned (incorrectly, as it turns out) that I didn’t want a second Pugsley, so I traded the yellow frame-set with one of the fat-bike fanatics that works at my LBS for a black Surly Troll. Before I took it home, I had them prep the frame and install a green King headset. And then, like many of my bike projects, it hung in the shop for some time. After a year or so, I even made a half-hearted attempt to sell the frame-set + headset, but didn’t have an serious inquiries. Back on the hook it went. And then, over the winter, I finally decided to get it together. This is how it turned out. Even though the Troll is designed for 26-inch wheels, I decided to do something a little different and build it up with 650b wheels. Now, 650b versions of the Troll aren’t all that uncommon, especially now that there are more good 650b all-road tires and plenty of 650b/27.5 off-road tires. But most of the time, this sort of conversion is done using disc brakes. But anyone who’s been around here for long will know that I’m not a fan of discs, especially when there’s another option. The Troll has both disc mounts and cantilever posts, so clearly disc brakes weren’t warranted. And I knew from reading something that Nick Carman wrote on the VO website a while back that it was possible to convert a Surly Long Haul Trucker to 650b using Tektro CR720 cantilevers. I figured the Troll’s axle to post distances would likely be the same. So that’s what I did. I paired a set of black Tektro CR720s with a set of Velo Orange 650b wheels (handbuilt locally by Earle Wheels). The front brake pads aligned with no trouble at all, but the rear pads didn’t look like they’d ever line up–until I stepped back and gave the geometry of the rear end a little more consideration. That’s when I realized that while the pads would never line up (there’s not a lot of leeway in this setup) with the wheel all the way forward in the weird Surly horizontal track-ends, it was likely that it would work if I moved the wheel back a centimeter or so. Some testing proved this to be the case, and I was in business. And just to make sure things stayed where they need to be, I installed a set of Surly Monkey Nutz. Crank bolts also work in a pinch. As for the rest of the bike, it’s basically a poster-child for many of my current preferences and fetishes: 1×10 drivetrain, Jones bars, Brooks saddle, King headset, lots of Paul bits, and no decals whatsoever. 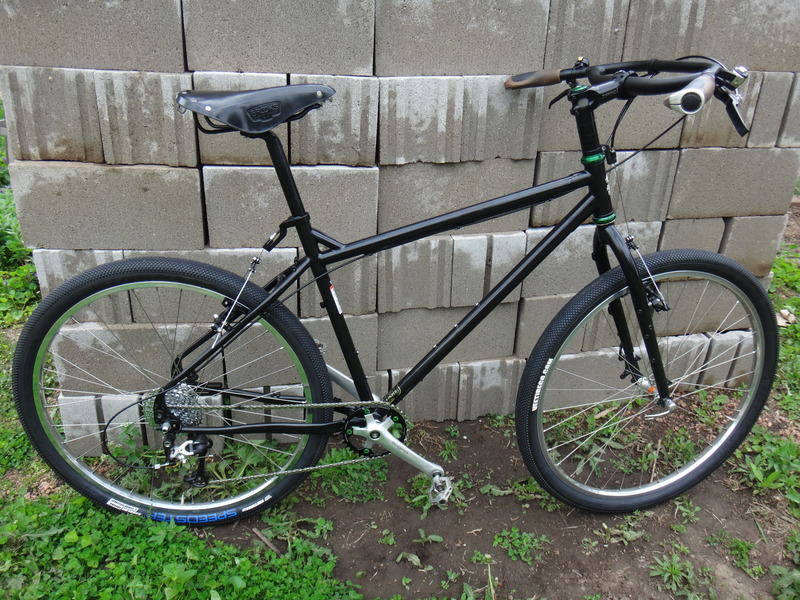 I’ll add fenders and a front Surly rack after I ride it on the 100k version of the Bear 100 this coming weekend. Until then, it’s either running naked or with some combination of Revelate soft bags (both the Tangle and the framebag from the Pugsley fit fine). For the full specification, head on over to the Troll’s very own page.